Regarded as one of the world’s greatest rail journeys, The Ghan delivers so much more than an extended train ride. Prepare to journey deep into the heart of Australia on the legendary Ghan, accessing parts of Australia no other holiday can come close to, while offering the perfect balance of comfort and adventure. Travelling on this iconic train, you can enjoy the comfort and solitude of your private cabin, socialise in the relaxing lounge, or simply gaze out of the window at your ever-changing landscape. Step aboard the legendary Ghan at noon. Once you’ve settled into your private cabin, venture to the classically styled Queen Adelaide Restaurant carriage for a delicious lunch, accompanied by your choice of fine wines. With all meals and beverages included in your Platinum or Gold Service fare, you can afford to leave your credit card tucked away in your cabin. A three course meal in the Queen Adelaide Restaurant is bound to satisfy and as darkness falls outside the train’s windows, talk inevitably turns to the impressive outback gourmet menu. Entrees include a South Australian Regional Seafood Tasting Plate, a succulent rack of lamb for mains, and your choice of desserts including a regional cheese plate with Barossa Valley brie, Limestone Coast clothed cheddar and Lobethal goat blue. For those with a little steam left in the engine, make new friends in the Lounge or if all that mouth-watering food and sightseeing has taken it out of you, head back to your cabin for a good night’s sleep in anticipation of a striking outback sunrise. Wake up with a coffee or juice and witness an unforgettable outback sunrise at our new morning stop in Marla in the remote reaches of SA. Back on board, it’s time for brunch. Enjoy a light bite from the extensive menu or order something a little more substantial – perhaps a full breakfast complete with eggs just the way you like them. And while you’re in the Queen Adelaide Restaurant why not try the Belgium chocolate waffle with strawberries, chocolate sauce and double cream? You are on holiday after all! After a few more coffees, fresh juices and more incredible outback scenery, you’ll be arriving in iconic Alice Springs. Watch the dramatic Outback landscape disappear into the horizon, all the while enjoying the solitude of your cabin, reading or catching up on your favourite podcast, then mingling with fellow travellers in the Lounge car for afternoon tea. 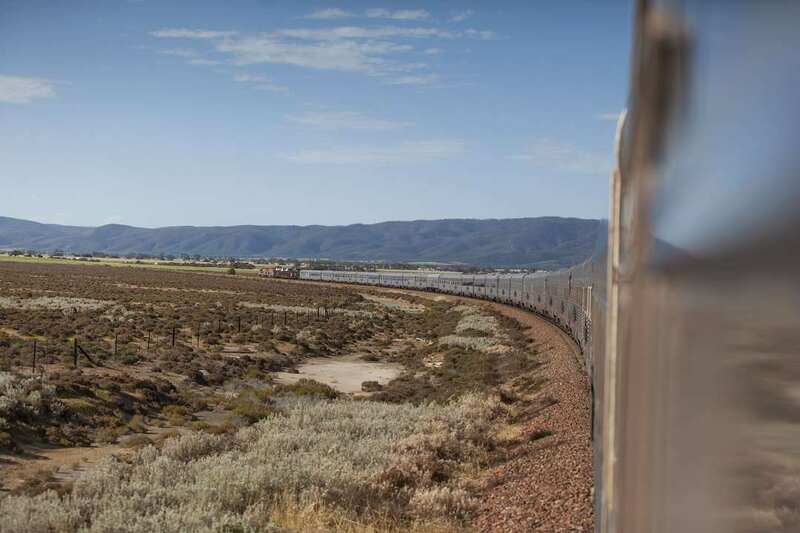 A three course meal in the Queen Adelaide Restaurant is bound to satisfy and as darkness falls outside the train’s windows, talk inevitably turns to the impressive outback gourmet menu. Entrees include a South Australian Regional Seafood Tasting Plate, a succulent rack of lamb for mains, and your choice of desserts including a regional cheese plate with Barossa Valley brie, Limestone Coast clothed cheddar and Lobethal goat blue.The selection of wines is equally outstanding and staff are expert in helping you find the perfect drop to match your meal. After breakfast, The Ghan arrives into Katherine, where we disembark and have the opportunity to visit nearby Nitmiluk National Park, home to the spectacular Katherine Gorge. The gorge is a series of 13 sandstone gorges carved over many millions of years by the Katherine River. As we cruise up Katherine River, calls of the cicada resonate across the water between the towering sandstone cliffs. Listen to stories of how the gorge was named, whilst marvelling at the sheer walls, etched by time and the elements, and home to a myriad of plant and animal life. Afterwards we return to The Ghan in time for a delicious lunch and continue our journey to Darwin. Through the big screen window of your cosy, well-appointed cabin, you’ll watch the haunting outback unfold. And after a day of off-train activities, your cabin provides the perfect place to relax and recharge before heading for the lounge or dining carriage. With room to stretch out and all the comforts of home, Gold Service is the most popular level of service aboard The Ghan. You’ll enjoy private cabin accommodation together with all-inclusive dining and beverages. Gold Service accommodation is available in both single and twin-share. During the day, the compact Twin Berth Sleeper Cabins offer a comfortable three seater lounge, converting to an upper and lower sleeping berth at night. And you’ll enjoy fresh sheets, bath towels, pillows, duvets and complimentary toiletries. Twin Berth Sleeper Cabins have private en-suite facilities with a hide-away compact toilet, wash basin and shower. Feeling peckish? 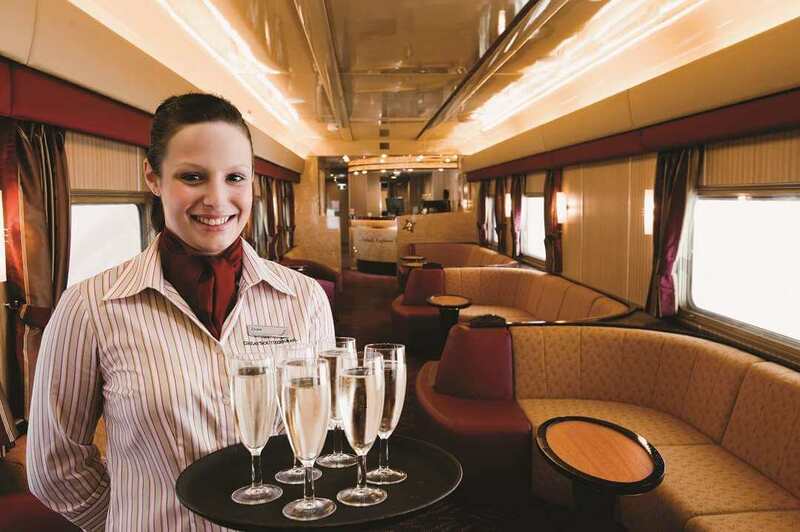 Step out of your cabin and into the exclusive, classically styled Queen Adelaide Restaurant Car where an all-inclusive menu is prepared by on-board chefs using fresh local fare. Our seasonal menu features mouth-watering dishes such as saltwater barramundi and grilled kangaroo fillet. Platinum and Gold Service includes hearty breakfasts, two course lunches and three course dinners. You may also choose to complement your meal with our selection of wines and beverages included in your fare. One of the world’s most exclusive restaurants, the Queen Adelaide Restaurant’s ornate styling reminiscent of old-world rail travel and is set in the midst of stunning valleys, deserts and mountain ranges. Dynamic menus showcase the finest regional flavours available – from Top End barramundi, locally-produced beef and lamb, Margaret River cheeses, Barossa Valley small goods and native Australian fare including kangaroo, saltbush and wild rosella flower. All meals are complemented by a range of all-inclusive wines, beers and non-alcoholic beverages. The Queen Adelaide Restaurant is open to all Platinum and Gold Service guests for breakfast, two-course lunch and three-course dinner. The Outback Explorer Lounge is the perfect place for travellers to come together and share stories, all while enjoying a wide range of all-inclusive refreshments. All day and often late into the night, the Outback Explorer Lounge is the train’s centre of activity where long hours can be spent socialising, snacking and catching glimpses of passing wildlife through wide picture windows. 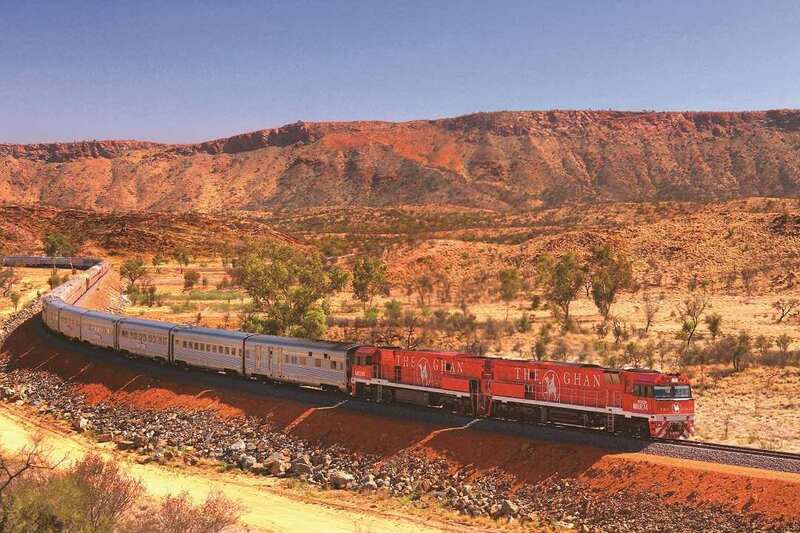 Originally the Afghan Express, The Ghan train was named for the pioneering cameleers who blazed a permanent trail into the Red Centre of Australia more than 150 years ago. Many cameleers were migrants from an area now known as Pakistan. However, according to outback lore in the 1800s, these men were believed to come from the mysterious outpost of Afghanistan and were considered Afghans – ‘Ghans. 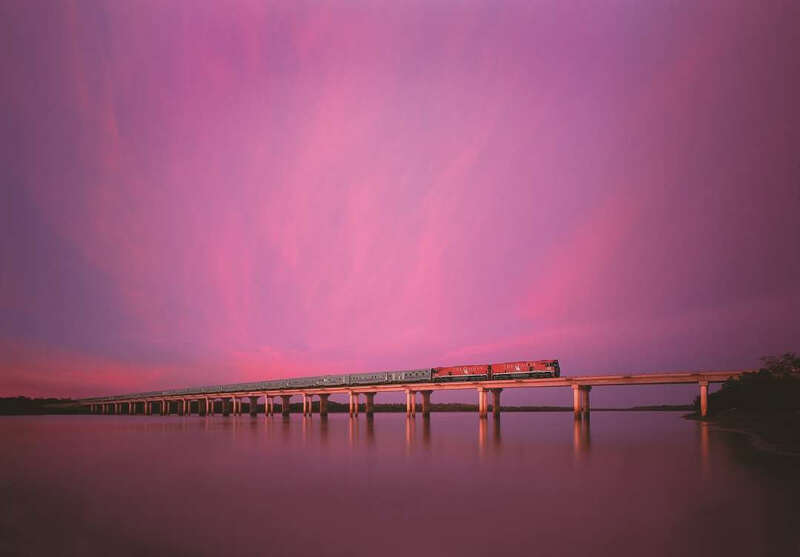 The original Ghan line followed the route of explorer John MacDouall Stuart. On Sunday 4 August, 1929, the first Ghan train carried supplies and over 100 passengers bound for the remote town of Stuart, later to be called Alice Springs. The train was steam hauled, and the service had to contend with extreme conditions including flash flooding and intense heat. The old Ghan ran on a light, narrow-gauge track well to the east of the track it travels today. As well as termite damage, the track was often savaged by fire and flood. Legend has it The Old Ghan was once stranded for two weeks in one spot and the engine driver shot wild goats to feed his passengers.